Australian Nick Kyrgios has become the sixth player in the world's top 20 to end his season early because of injury. The world number 20 has been struggling with a hip injury since June. "Unless I want this to escalate into an injury that requires surgery, I need to listen to my body," Kyrgios, 22, said. Earlier on Thursday, world number 18 Tomas Berdych called time on his season because of a back problem. Andy Murray, Novak Djokovic, Stan Wawrinka and Kei Nishikori had previously done the same. World number one Rafael Nadal pulled out of next week's Swiss Indoors Basel tournament with a knee injury. Krygios' injury prematurely ends a season that been blighted by indiscretions. 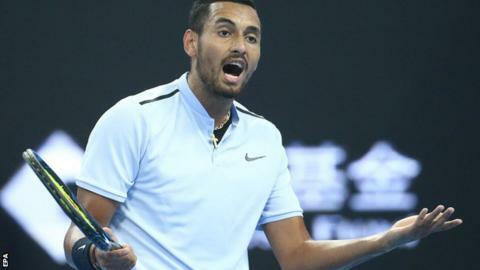 Earlier in October, he was fined $10,000 (£7,573) for unsportsmanlike conduct after he quit his first-round match at the Shanghai Masters because he lost the first set on a tie-break against Steve Johnson. That incident came two days after he lost to Nadal in the final of the China Open after becoming frustrated by a line call in the first set. "This year hasn't been as successful as I would have liked, especially at the Slams," he said. "It's no secret that I have had some sad moments to deal with away from the court which have added to my disappointments throughout the year." Berdych, meanwhile, said he had been advised by his medical team to "give it a few weeks of rest". "I have been playing with back pain since Wimbledon," said the 32-year-old Czech, who has withdrawn from next week's Erste Bank Open 500 in Vienna and the Paris Masters, which begins on 30 October. He said: "I really think it's best for me to be ready and healthy for the January tournaments and the Australian Open, which is one of my favourite tournaments."